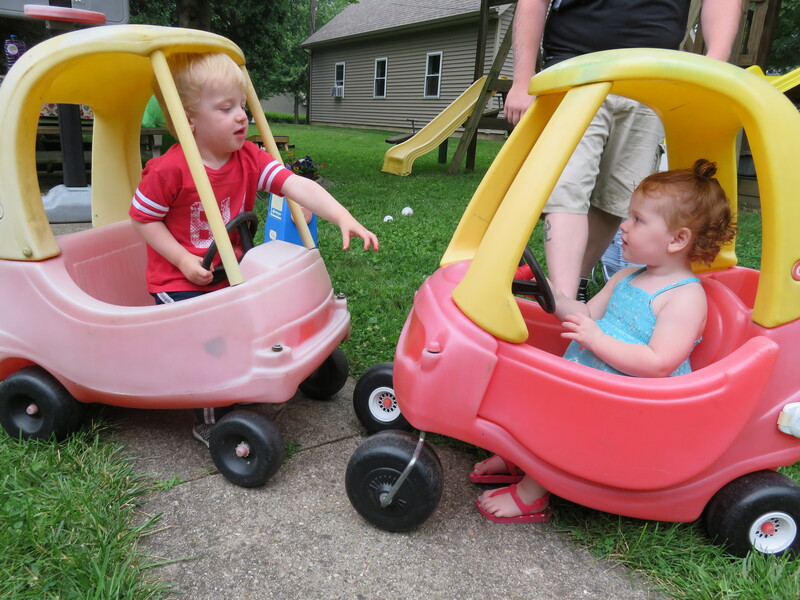 My grandson and great great niece parking their cars. At an event or an amusement where there was a parking crew, have you had to park someplace that irked you? I think I will forever look differently at the job of parking cars. Particularly in a poorly marked grassy field. Sooooo, what happened was my husband and I, along with others from our Lions Club volunteered to help park cars at our local county fair. It is one of the bigger fairs in our state, and generally well run, with hundreds if not thousands of volunteers. The cherry on top for our efforts was a monetary donation to our club for our assistance. It was hot, it was muggy, it was chaotic. On the positive side, we learned that 99 percent of people are gracious even when you’re asking them to park in a row far from the entrance gate, and even though they said they hurried to arrive early so they could park in a good location. No, I didn’t see anyone arriving at the fairgrounds dressed like this. Folks, when it comes to getting a good space (meaning close to the entrance) at huge fairgrounds, that’s a wild hope. It happens to a lucky few, but when you go to Disney World, you expect to park in Timbuktu and walk, right? They may have a monorail to whisk you to entrance gates but you are still likely to walk forever to catch the monorail. At least that’s the way it was when I last went to Dizzy World. Problems: untrained volunteer parkers; folks driving dreamy sports cars desiring huge spaces to protect their doors; excited children erupting from carseats; a parking coordinator who tried to make volunteers tell people who had parked and left their vehicles to get back in them and move them four feet—I kid you not; and trying to straighten rows where early afternoon-goers had parked willy nilly (without parking crew). I smiled a lot and thanked people for cooperation, and said they could be happy they didn’t have to use the far far parking lots up the back hill of our fairgrounds. I was also known to look the other way if folks said they had a passenger who had trouble walking, and motioned them to drive on up closer and find a space. If we had had curbs and markers like these …. no sweat! My husband is an experienced parker and crew leader for overflow events at our church such as large funerals when we must park cars on our church front lawn. He’s a master at it, and doesn’t mind enforcing rules either, and mostly he does it kindly and makes sure those who have walking difficulties can park as close as possible. But he heats up when drivers try to pull rank and tell you they’re pastor so and so from such and such (at services where there are lots of ministers attending). I saw our building supervisor at the office having what to me was a hard task the other day: kicking people out of our office parking lot. Another job I wouldn’t want is giving tickets to people who’ve overstayed their two-hour time period on the side streets near our office. Back to the fairgrounds and the one percent of people who went ugly on us. 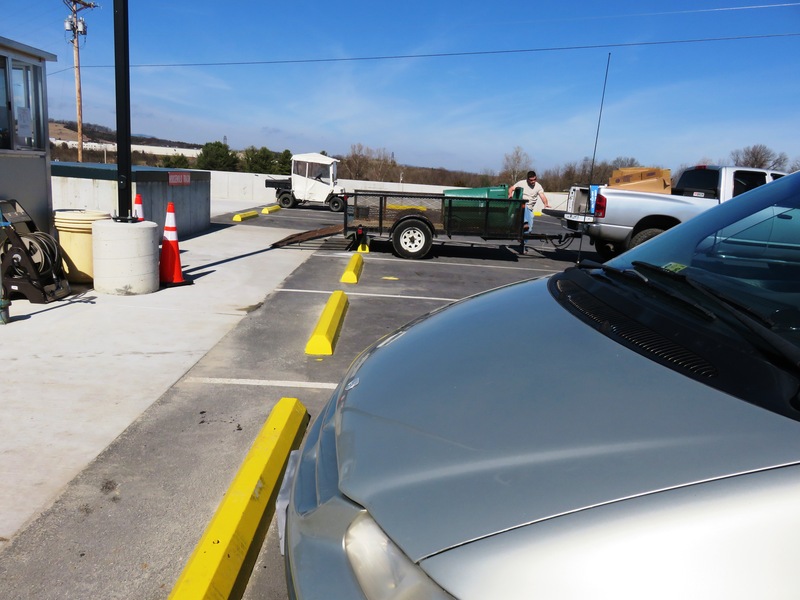 The regular parking officials said the goal was to prevent people from blocking each other into their spaces—other years they had to call tow trucks when parking went way awry. Remember that parkers have a bigger picture of the planned traffic flow, and we’re asked to follow directions for our own good, to stay out of trouble. You can make spiritual applications there if you wish! Such is life on a hot August day in the rural valley we call home. We survived and as far as I know, no one was hurt while parking or walking from the far-flung fields that night. We learned a lot about humanity and maybe ourselves. Not bad for an evening’s work. Parking gripes? Leave them here! Parking praises for kind people? Or, what was your worst—or best volunteer experience? Comment here or send to anotherwaymedia@yahoo.com or Another Way Media, P.O. Box 363, Singers Glen, VA 22834. No gripes, just this: In hot weather, I seek a parking spot under shade. Even if I have to walk extra far, a cooler car is worth it. Besides, I rack up more steps on my Fitbit! You are absolutely right, Marian, on several counts. On the fair parking those who had to walk extra far, were able to drive off the parking lot without backing up and found it much easier to find their cars. Oh dear, what an experience! I don’t think that’s one I’d volunteer for. I’m one that usually parks out in the North 40 from the store. 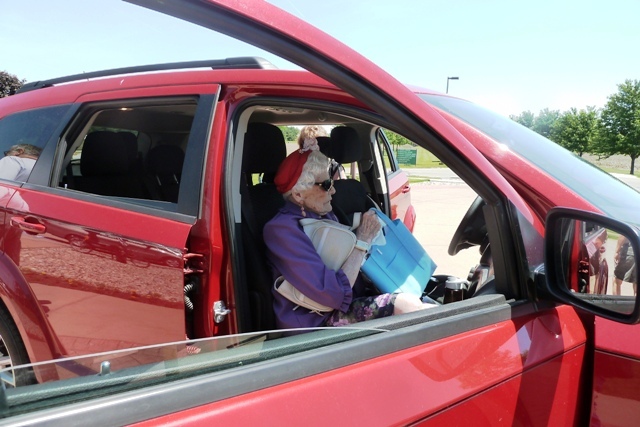 I’m with Marian, I get more walking and it’s better for my health – and my doors get dinged less, which I like too. A few weeks ago we went to the local farmer’s market. There were three rows of parking. I typically would go for the row farthest away. But my better half has a knee with a lot of pain, so I pulled into the middle row as a compromise. I got grumbles from the passenger seat about not being right up front, where there was an open space. I said…I DON’T want to park that close. The car doors get more dings. So I’ll tell you what, I’ll pull up, let you out so you don’t have to walk and then I’ll go park where I want to park. PS – LOVE the picture of the grandson and great-great niece parking! Thanks, I thought the grandson picture made a great fun illustration. 🙂 I often park further out also, to get more exercise. In our old parking lot before our office moved last fall, I always parked farther away from the main office door. Not a lot of extra steps but they do add up. Now at our new office we are allowed only 5 parking spaces so can take turns sharing them, but I don’t participate in the normal sharing rotation, for the same reason. I’m enjoying walking new parts of town and exploring places I’ve never seen in my 40+ years in this town. 🙂 Thanks for checking in Trisha! Most people I know would grumble about having to share 5 spaces and take turns with it. You’ve turned what could be an irritation into a delightful experience!